1Which setup is right for you? Welcome to Grasshopper! We want to ensure that you can start making and receiving calls as soon as you sign up, so we’ve configured a few default settings to get you started. Grasshopper makes it easy for you to continue with the default “out-of-the-box” configuration, or to log in and customize your account however you need. If it’s just you running the show, you probably just need a separate business line to forward directly to your personal phone. If that’s the case, then our default configuration will do that automatically! You can start using your new business line right away as we’ve programmed calls to forward to the phone number you entered while signing up. If you need to make a change you can do so by logging into our admin portal or via our mobile app. One thing to note: Our default configuration also includes playing a default main greeting. (i.e., “Thanks for calling. Please press 0.”) You can easily disable the main greeting at any time. Want to present your business a bit more formally and professionally? In this case you’ll probably want to record a custom main greeting for customers to hear when they call your company. Often customers in this category will set up employee extensions as well and take advantage of our dial by name directory – but it's not required! As your business grows, you may want to have a more elaborate company greeting with call forwarding to specific departments and teams. Continue through this guide to learn about the configuration options available to you to accommodate this setup! 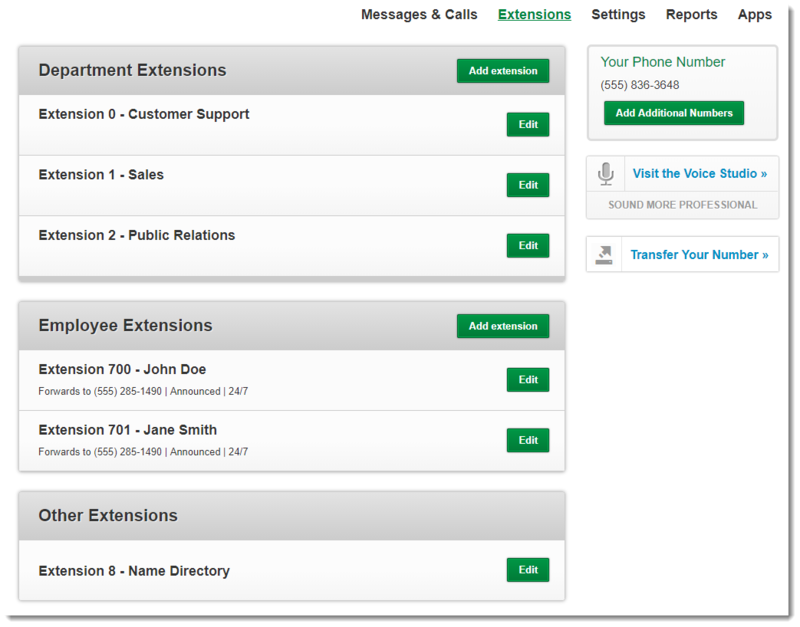 Extensions determine how calls are routed to different individuals within your Grasshopper account. 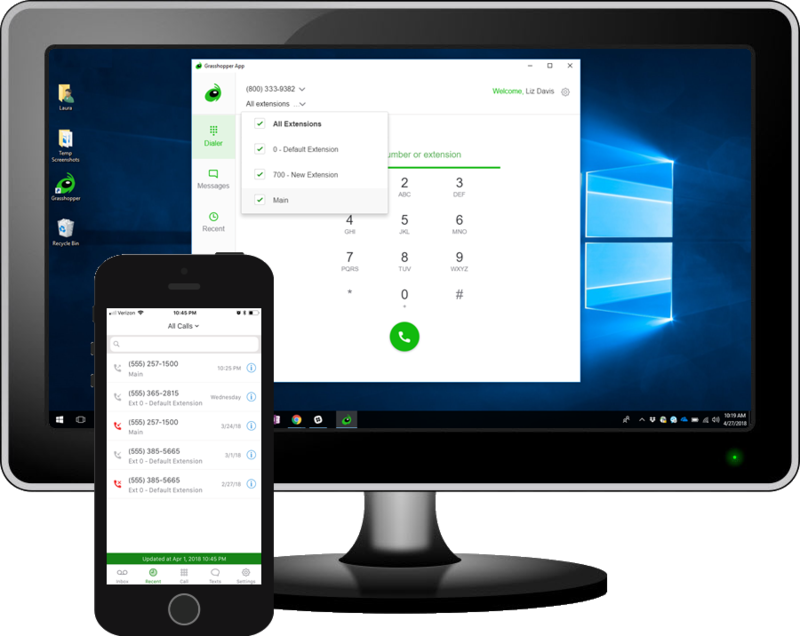 Unless you only need simple call forwarding, you'll rely on extensions to set up the behavior of your call forwarding system. As part of your default account configuration, we’ve created a default "Extension 0" for you and set it up to receive calls at the same contact number you signed up with. You can start out by editing Extension 0, or by creating a new one. Note that you can use any combination of department and employee extensions, which function the same but look a little different (department extensions are 0-6, while employee extensions are 700-799). Control when, where and how calls are forwarded. Select how incoming calls are displayed and what calllers hear. Edit the name, number, time zone and user access. Set up greetings and vacation schedules. Log in to the Extensions page to start creating extensions. 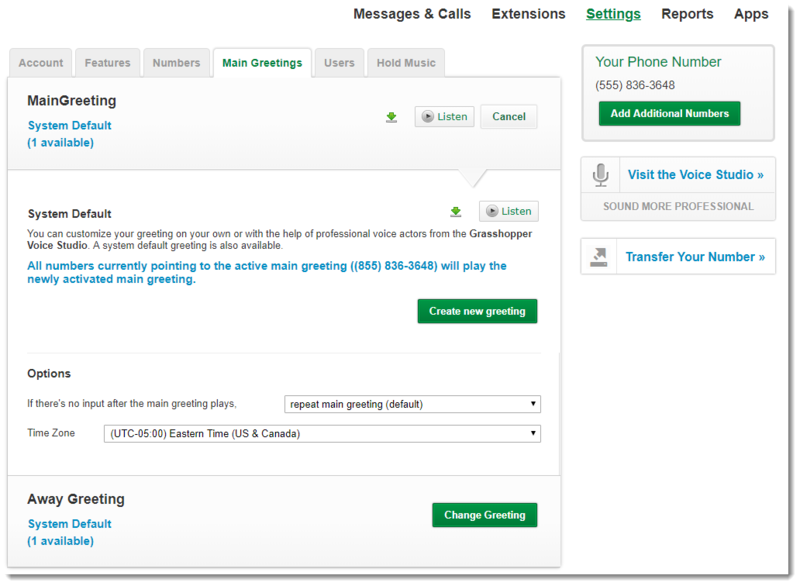 Recorded greetings help guide customers through their calls as seamlessly as possible. Your account offers lots of different places to customize greetings and voicemails, including away messages, call forwarding announcements and extension voicemails. Most of these come pre-loaded with a system default as part of your initial account configuration. As part of the default account configuration, we've created a default main greeting that says "Thank you for calling. To speak to a representative, please press 0." You can customize or disable this yourself, or leave it to the pros! Learn more about the different greetings available to you and how to record or upload them. You can set up additional phone numbers within your account with just a few clicks. If you need additional numbers beyond those allotted in your subscription plan, you'll see a one-time activation charge and a recurring monthly charge for each additional number. Play the default main greeting. By default, customers will hear the message: "Thank you for calling. To speak to a representative, please press 0." Play your custom greeting. If you've recorded or uploaded a custom main greeting, then you should select "Play my main greeting" to switch from the default greeting. Forward to an extension. If you prefer, you can also skip the main greeting and send callers straight to one of your extensions. Log in to the Settings page and open the "Numbers" tab to add additional phone numbers. Learn more! Do you already have a business number you want to use on the Grasshopper platform? No problem! Grasshopper offers phone number transferring (or “porting”), which moves a phone number from your existing provider to your Grasshopper account. 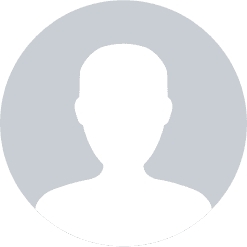 Note that this can take a few days to process, so in the meantime we have assigned your account a temporary number so that you may get started customizing your extensions and recording your greetings. 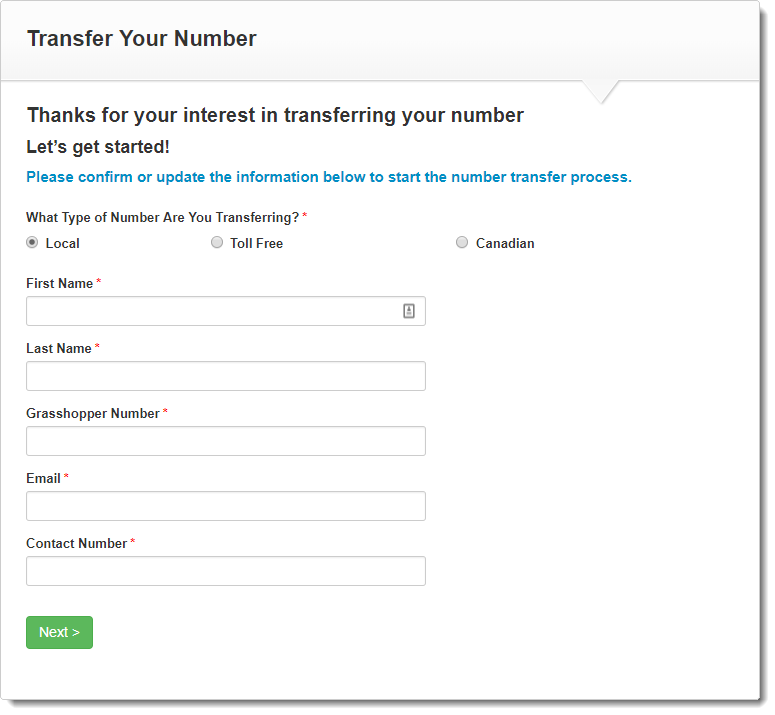 Then when your number transfer completes, we’ll add it to your account and apply the same settings. You can either keep the temporary one, or swap it out for the new one. Submit your transfer request to get started. Ready to start receiving calls? 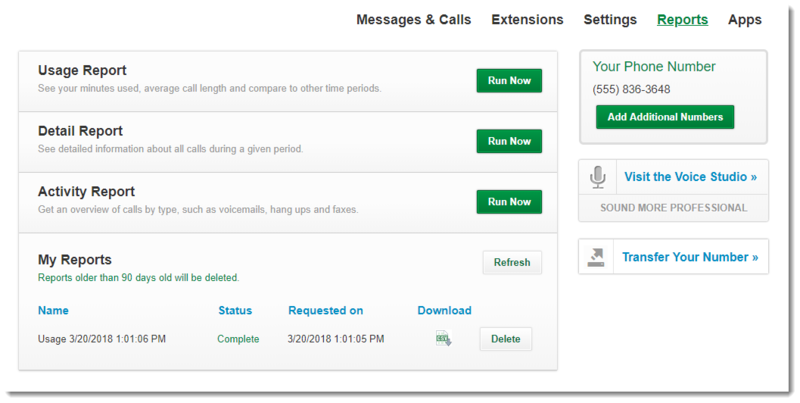 Install our smartphone and desktop applications to manage your calls, texts, and voicemails from your home office or while on the go. The iOS and Android apps even allow you to manage some basic account settings while you're out, including call forwarding and notifications. By completing the steps above, you’ve gone the extra mile to personalize your callers' experience. Great job! There's more to love, though. The administration portal offers a wide variety of additional settings and features that allow you to fine tune exactly how each phone number and extension works. Log in to the administration portal for even more customization options. Looking for an even more custom setup? No problem! Give us a call and we’ll help you configure the account exactly as you need it.